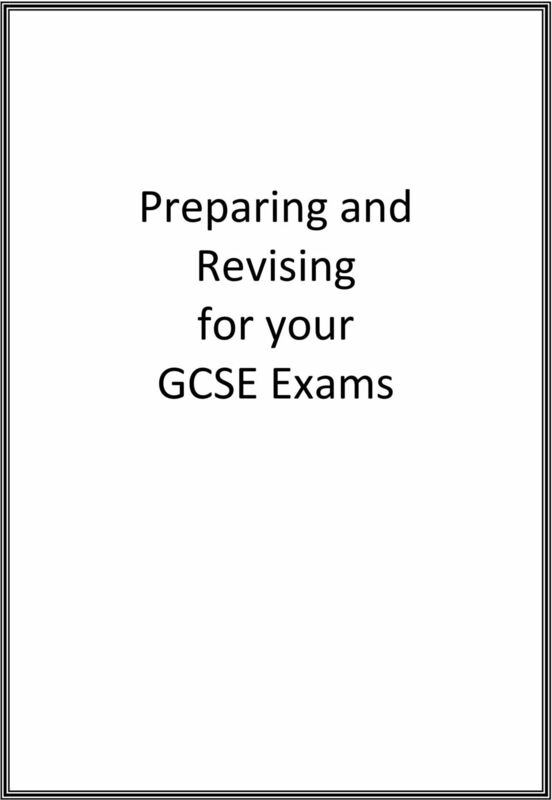 Download "Preparing and Revising for your GCSE Exams"
3 Preparing and Revising for GCSEs Page 3 Introduction Most of you are involved in coursework and project assignments for your GCSE subjects and are beginning to feel the pressure of this final step in your school career. During the winter term, you will be sitting your Year 11 mock exams in most subjects and now is the time to get to grips with the best ways of achieving good results with careful and planned revision. Proper revision cannot be done in just the few nights directly before the exams! It is something that you should constantly be doing in some way. 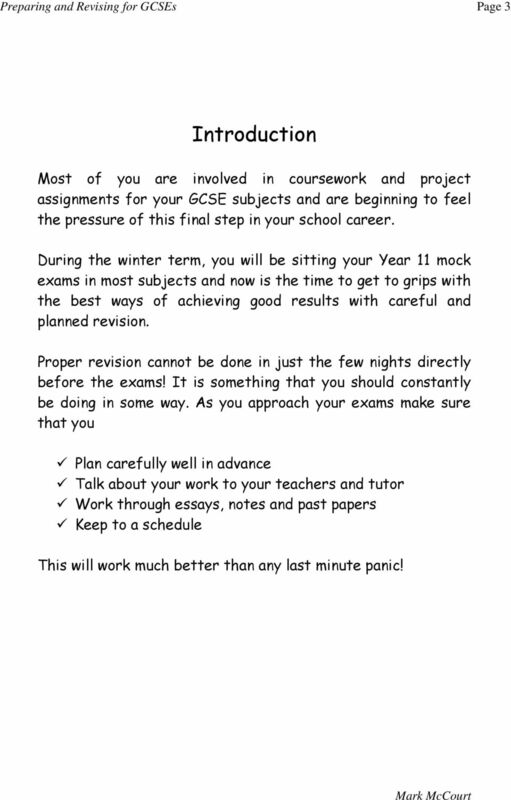 As you approach your exams make sure that you Plan carefully well in advance Talk about your work to your teachers and tutor Work through essays, notes and past papers Keep to a schedule This will work much better than any last minute panic! 5 Preparing and Revising for GCSEs Page 5 What you need to revise Check through your various subjects, listing the various major topics and their parts. Refer to past papers so that you know how questions will be asked on each section and topic; Do the examiners want: Essays? Shorts answers? One-word answers? List those topics or parts which you feel unhappy about which need more attention than others. Don t give all topics equal importance. By mixing subjects and topics which give you difficulty with those which are easier and/or interest you more, you will be able to plan a varied programme of revision so that you don t get bored by doing too much of one subject, or depressed by doing things which you find very difficult. Where to revise? Everybody needs to work out where and how they work best. Don t fool yourself that you can work in front of the TV!!! You can t!!!! Some people find it useful to work in the same place all the time, every time. Others find it useful to have a change of scenery, working somewhere else each time. For how long? Remember that your concentration span is limited! Have a timed break but make sure that you start again! Don t get caught up in some terrible TV show! 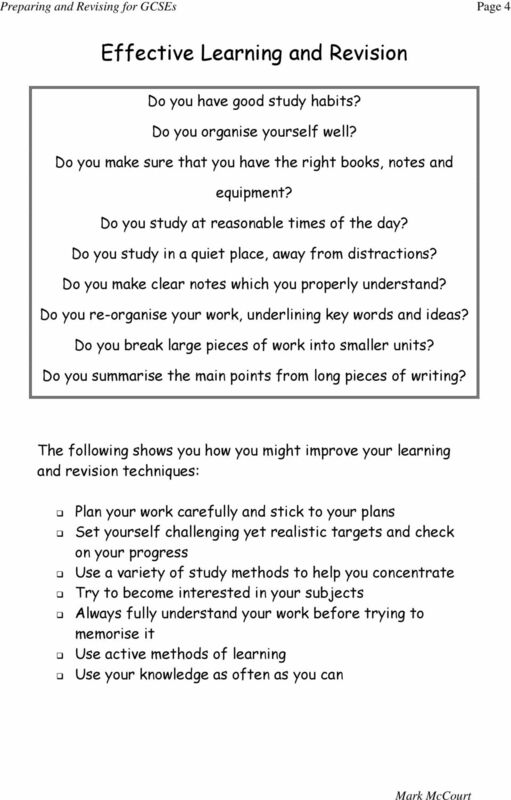 10 Preparing and Revising for GCSEs Page 10 Examination Questions Will all the examination questions require the same type of answer? Do you find some questions more difficult than others? 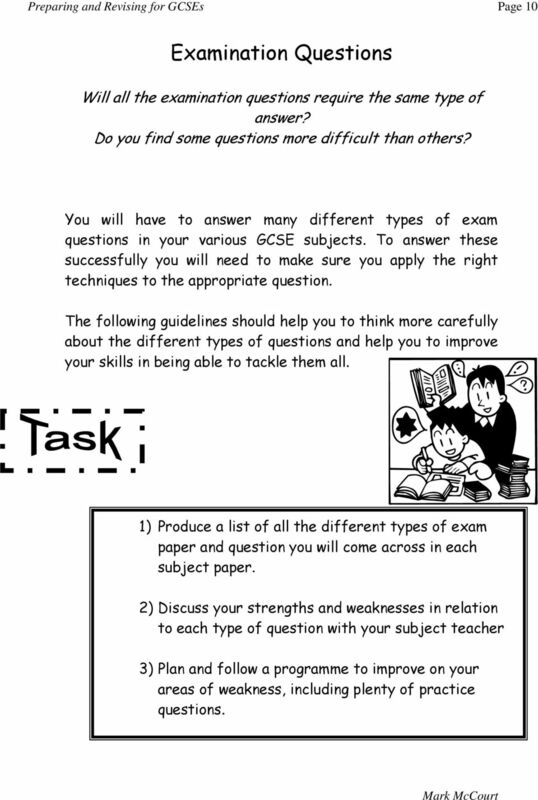 You will have to answer many different types of exam questions in your various GCSE subjects. To answer these successfully you will need to make sure you apply the right techniques to the appropriate question. The following guidelines should help you to think more carefully about the different types of questions and help you to improve your skills in being able to tackle them all. 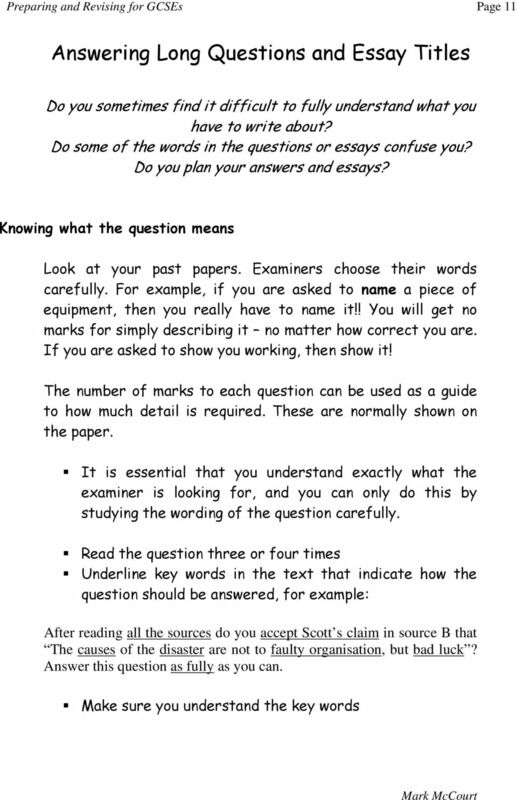 1) Produce a list of all the different types of exam paper and question you will come across in each subject paper. 2) Discuss your strengths and weaknesses in relation to each type of question with your subject teacher 3) Plan and follow a programme to improve on your areas of weakness, including plenty of practice questions. 12 Preparing and Revising for GCSEs Page 12 Planning essay answers Unplanned answers are not good answers. They are often unclear, muddled, repetitious and full of irrelevant comments. So, quite rightly, they get low marks! You must spend a few minutes planning your answer. Make a few notes on the examination paper of the main points / useful facts / relevant examples. Do not forget to cross out the notes when you have answered the question Structuring your answer All good answers are well structured. 1) They have an introduction that tries to explain the terms of the question. This may include a statement of your own views or opinions 2) They are written in paragraphs which a. Keep to one main point of the question b. Contain supporting facts, details, figures, examples, evidence, etc. c. Link at the end to the next paragraph 3) They reach a conclusion in the final paragraph, related to the original question and tying up the main points. 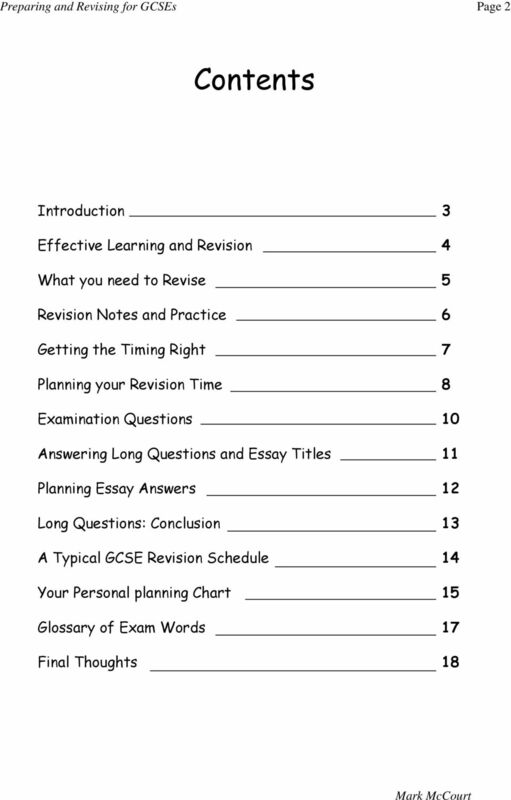 14 Preparing and Revising for GCSEs Page 14 A typical GCSE revision schedule January/February Review your performance in the winter mock exams and identify your weaker areas. Respond to points made by your teachers in your report and on parent s evening. 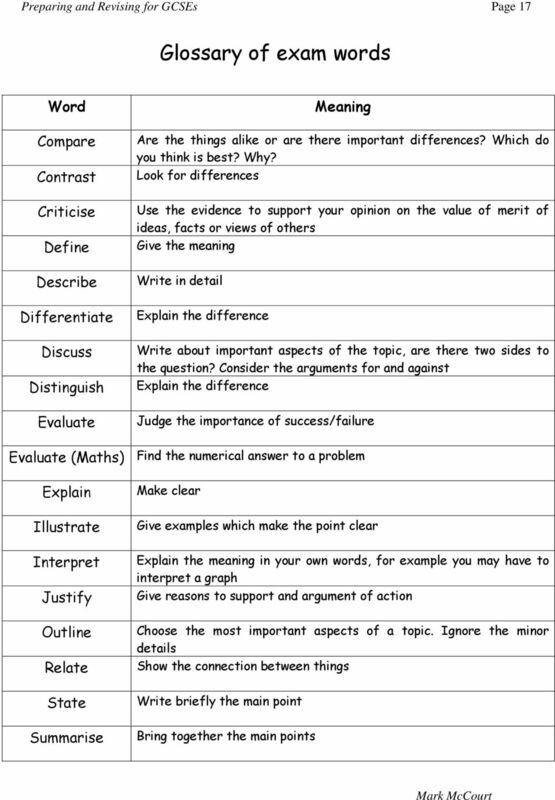 Discuss all of these with your teachers and plan some action to make sure of improvements. March Time is catching up! Check details of the time, date, content and organisation of your final GCSE exams. 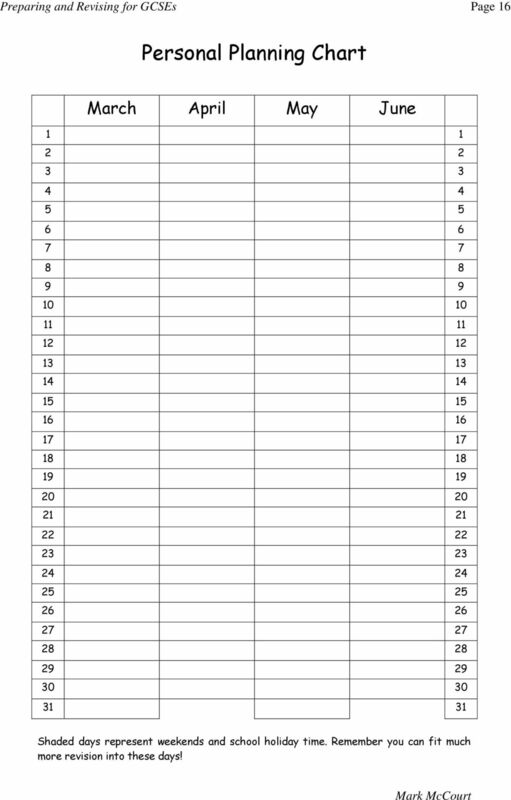 Enter times and dates on your planning chart. Discuss problem areas with your teacher. List areas needing attention and make time to attend to them. Fill in your study week planner. Review all of your work and rewrite poor sections. Read as much as you can about all topics and add extra information to your notes. March/April Make notes and lists of key facts and points for each section of work in each subject. 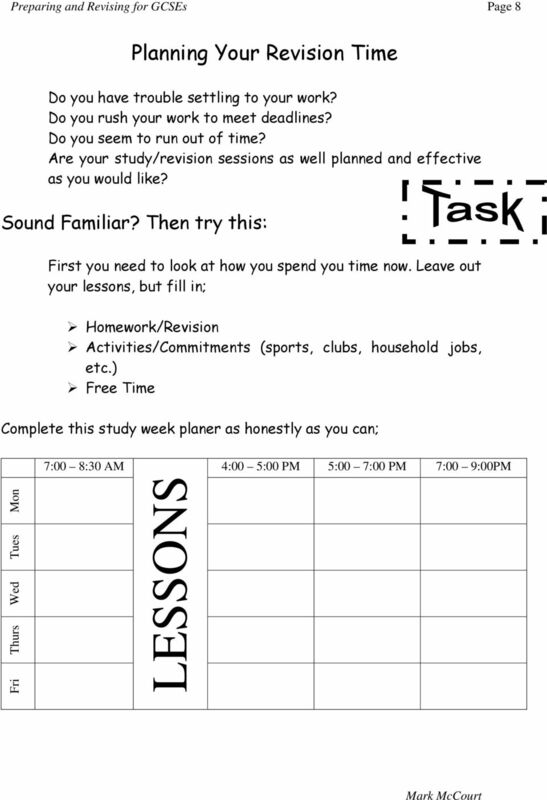 Plan and begin a comprehensive learning/revision programme and enter this on your planning chart. 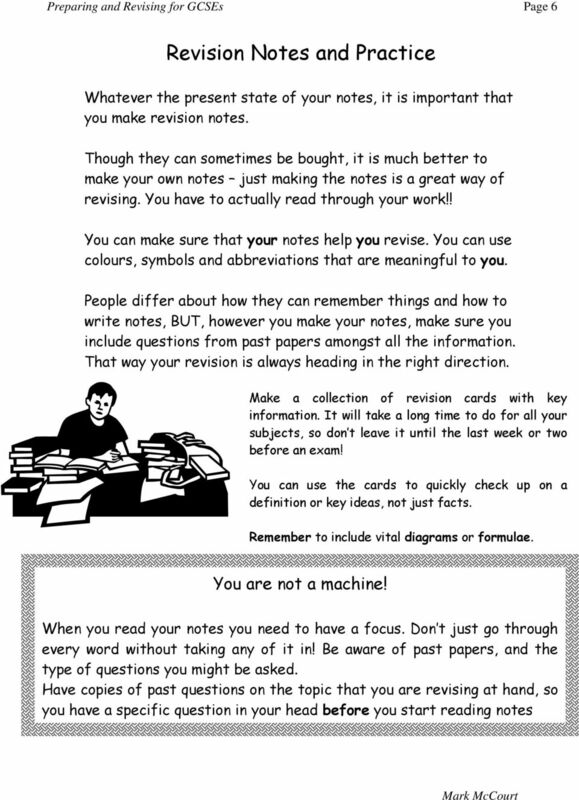 April Revise! Revise! Revise! 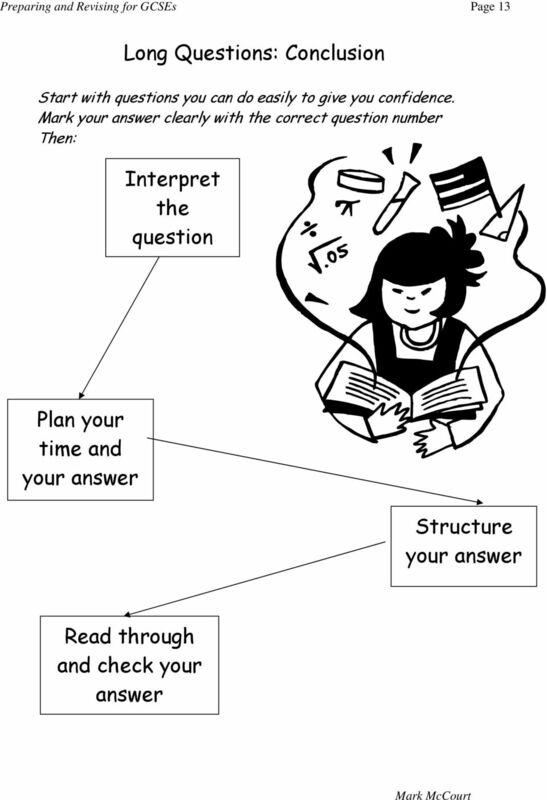 April/May Test yourself on different types of questions in exam conditions. Practice your timing. Continue to talk to your teachers! May/June Get plenty of sleep. Know what to expect in each paper. Be properly equipped. Get to school in good time. Examinations! 15 Preparing and Revising for GCSEs Page 15 Your Personal Planning Chart You really need to plan how to spend the months leading up to your exams. A last minute rush will leave you panicky and tired. You need to fit in relaxation time as well as revision. You may not have many months left, or your schedule may have gone wrong. Don t worry! The main idea - of planning the use of the time that does remain is still a good one. 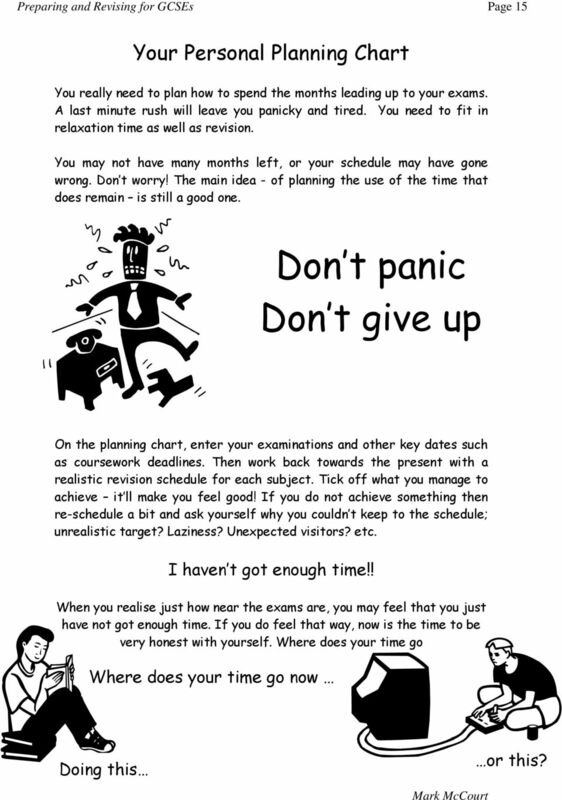 Don t panic Don t give up On the planning chart, enter your examinations and other key dates such as coursework deadlines. 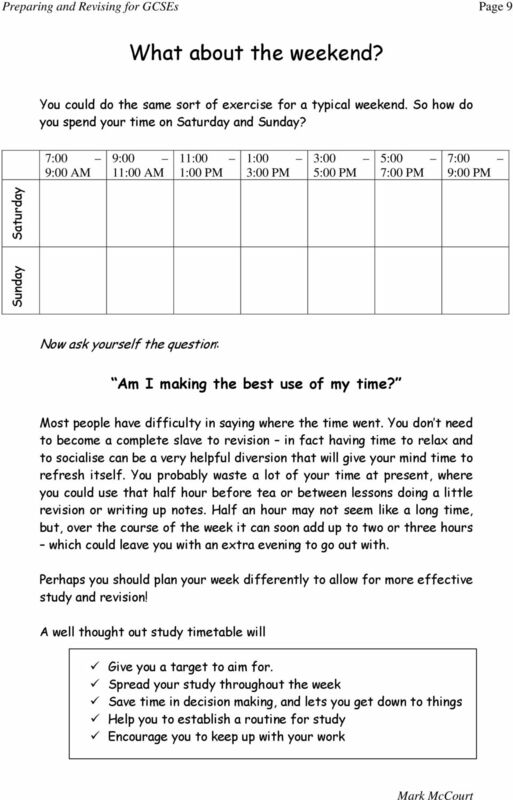 Then work back towards the present with a realistic revision schedule for each subject. Tick off what you manage to achieve it ll make you feel good! If you do not achieve something then re-schedule a bit and ask yourself why you couldn t keep to the schedule; unrealistic target? Laziness? Unexpected visitors? etc. I haven t got enough time!! When you realise just how near the exams are, you may feel that you just have not got enough time. If you do feel that way, now is the time to be very honest with yourself. Where does your time go Where does your time go now Doing this or this? 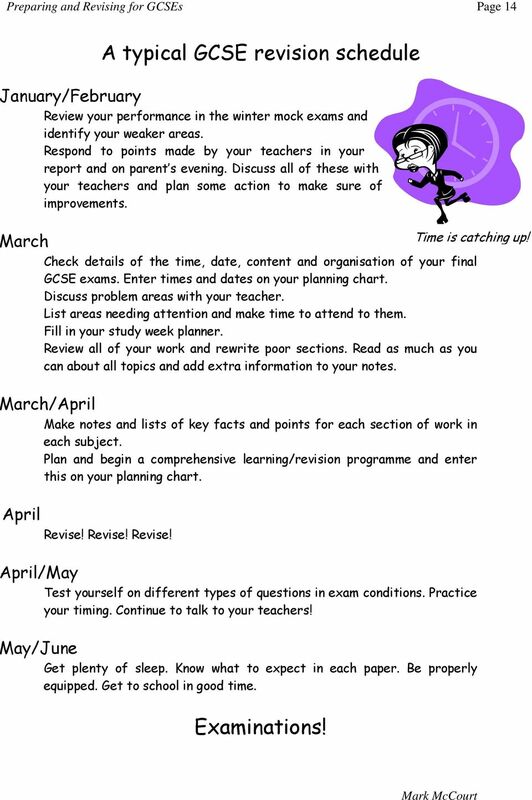 16 Preparing and Revising for GCSEs Page 16 Personal Planning Chart March April May June Shaded days represent weekends and school holiday time. Remember you can fit much more revision into these days! 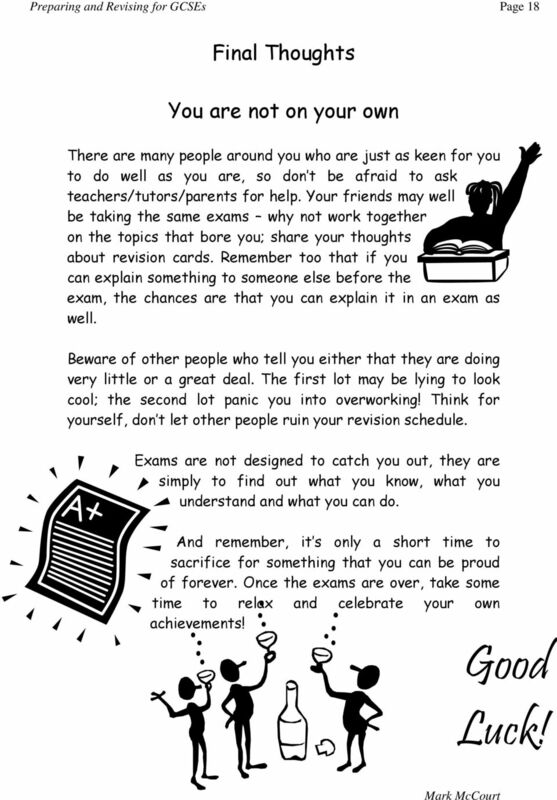 18 Preparing and Revising for GCSEs Page 18 Final Thoughts You are not on your own There are many people around you who are just as keen for you to do well as you are, so don t be afraid to ask teachers/tutors/parents for help. 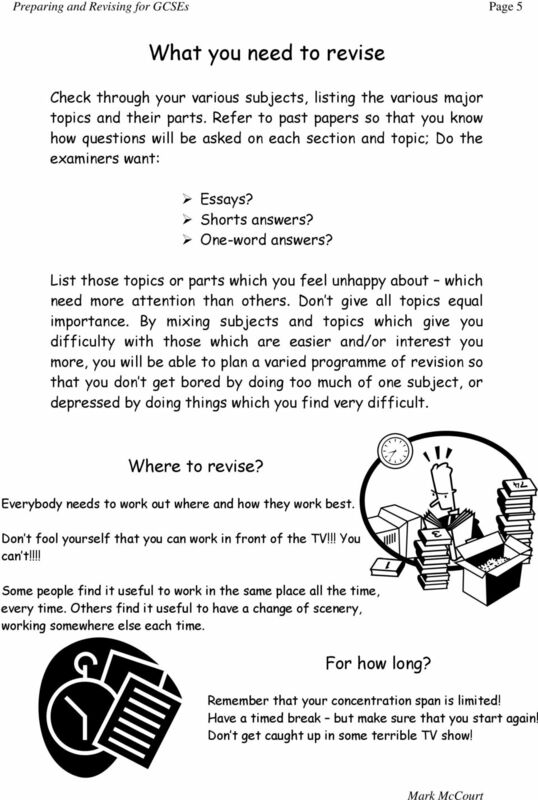 Your friends may well be taking the same exams why not work together on the topics that bore you; share your thoughts about revision cards. Remember too that if you can explain something to someone else before the exam, the chances are that you can explain it in an exam as well. Beware of other people who tell you either that they are doing very little or a great deal. The first lot may be lying to look cool; the second lot panic you into overworking! Think for yourself, don t let other people ruin your revision schedule. Exams are not designed to catch you out, they are simply to find out what you know, what you understand and what you can do. And remember, it s only a short time to sacrifice for something that you can be proud of forever. Once the exams are over, take some time to relax and celebrate your own achievements! Good Luck! Helpsheet EXAM PREPARATION. 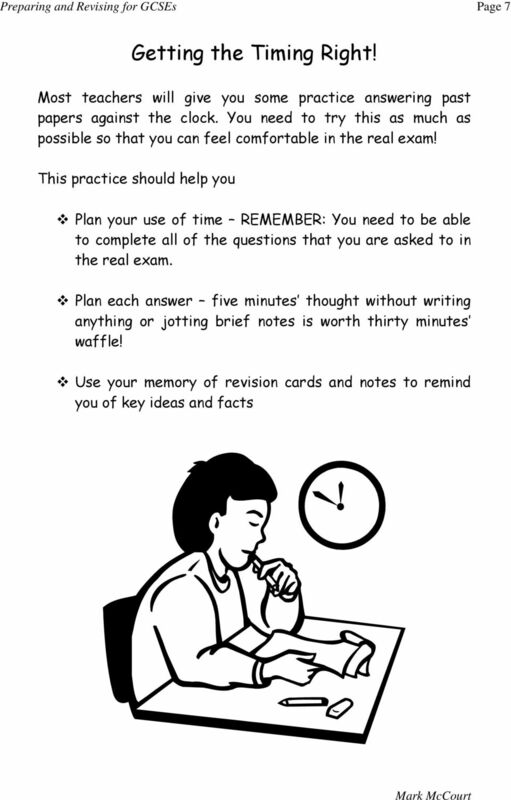 Read the exam preparation checklist below and consider: Which do I know how to do well? Which do I need to improve? Highlighting and annotating Many students find that marking their course materials with highlighter pens or annotating the text by writing in the margins helps them to concentrate and enhances their understanding. BEST ESSAY. There are 280,000 English essays written in the HSC. How to write the world s .05 EVERY TIME. Upper St. Clair High School Counseling Department Study Skills A Group Curriculum The group is designed to promote beneficial study, homework, testpreparation and test-taking skills in high school students.